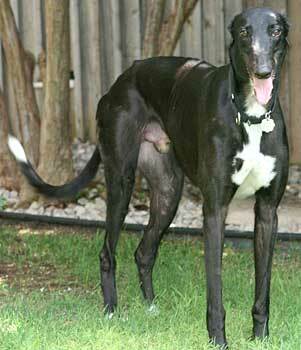 Trammel is a handsome 4-year-old black boy born March 27, 2003. His sire is Craigie Whistler, making his grand sire Molotov, and his dam is Flying Piaget. 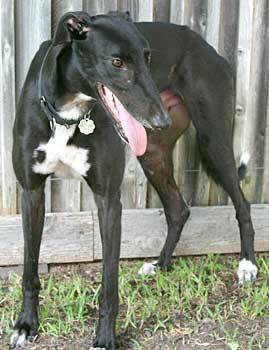 Trammel arrived on Easter Sunday 2007, with the greyhounds at the closing of Valley Race Park in Harlingen. He has 95 races to his credit according to Greyhound-data.com, starting September 6, 2004 at Gulf Greyhound Park in La Marque, Texas, and finishing at Valley Race Park on February 14, 2007. He is ready and anxious to find his forever home! Trammel currently lives in a foster home with 5 other dogs. It is not known if Trammel is cat tolerant, but he has had small dog (Standard Manchester Terrier and Toy Manchester Terrier) house guests this week, and has been a perfect gentleman with them. 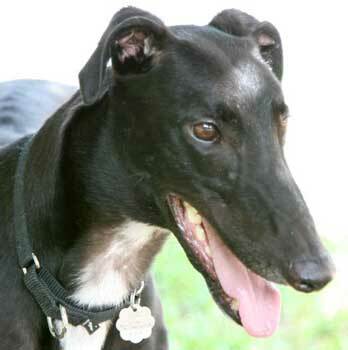 Trammel is a pretty black boy with a nice white blaze on his chest. He is 4 years old. He came to me a tall, skinny boy and now, after frequent feedings with good food, he is a perfect weight. Trammel stays loose in the bedroom while I'm at work. He can be crated, but does not go readily into the crate. <GRIN> But once in his crate, he is a quiet and nice boy. He likes to be with me and will follow me from room to room. He loves playing with my male doberman of the same age. Occasionally if another dog steps on him while he is sleeping he will wake up angry, but there is not anything but noise and showing of teeth. I do not know if he is cat safe as I do not have cats. He is fine with the greyhound puppies when they are loose together in the house or backyard. He is happy to sleep on his dog bed and doesn't sleep on my bed since there are too many dogs already on the bed. As with any greyhound, you should watch Trammel to make sure he doesn’t get into trouble while you are away. Using the muzzle until you are sure how he will act will handle that. He is a sweet boy who loves people and will make someone a very good companion.